304 pages | 21 B/W Illus. Setting the agenda for parliament is the most significant institutional weapon for governments to shape policy outcomes, because governments with significant agenda setting powers, like France or the UK, are able to produce the outcomes they prefer, while governments that lack agenda setting powers, such as the Netherlands and Italy in the beginning of the period examined, see their projects significantly altered by their Parliaments. With a strong comparative framework, this coherent volume examines fourteen countries and provides a detailed investigation into the mechanisms by which governments in different countries determine the agendas of their corresponding parliaments. 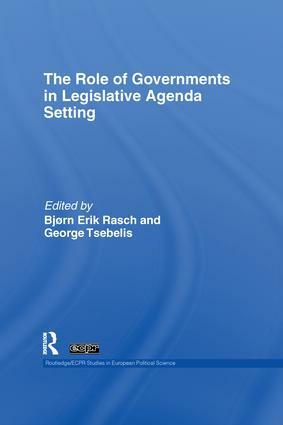 It explores the three different ways that governments can shape legislative outcomes: institutional, partisan and positional, to make an important contribution to legislative politics. It will be of interest to students and scholars of comparative politics, legislative studies/parliamentary research, governments/coalition politics, political economy, and policy studies. George Tsebelis is Anatol Rapoport Collegiate Professor, Department of Political Science, University of Michigan. He is the author of numerous articles on political institutions. His articles have appeared in professional Journals as American Political Science Review, British Journal of Political Science, Rationality and Society and Journal of Theoretical Politics. He is the author of "Nested Games: Rational Choice in Comparative Politics" (University of California Press, 1990), Bicameralism (with Jeanette Money; Cambridge University Press, 1997), and Veto Players (Princeton University Press, 2002). Bjørn Erik Rasch, Professor, Department of Political Science, University of Oslo. He has written numerous articles on parliaments, and has published nine books (in Norwegian). The most recent one studies parliamentary government and constitutional reforms (Kampen om regjeringsmakten, Fagbokforlaget 2004). His English language articles have appeared journals as Legislative Studies Quarterly, Public Choice, European Journal of Political Economy and Scandinavian Political Studies. Rasch was member of a Constitutional Commission appointed by the Norwegian parliament in late 2003 to review and modernize the Court of Impeachment. He also was member of a committee who designed a new electoral system for the Sami Parliament in Northern Norway. From 2005 Rasch has headed and coordinated the study programs in political science at the University of Oslo.